Bowflex PR1000 Home Gym Review - It Is Worth For You? Although a gym membership is always a great way to establish a fitness routine, this option is not necessarily always available to most people, as some may have tight schedules or lack gyms in the vicinity of their homes. If you are one of the people with a similar issue, then a perfect solution for you may be to get yourself a home gym set, which will enable you to exercise and strengthen pretty much every muscle group on your body in your own home. Since there is an increasing number of people opting for these home workout configurations, the market for them is rapidly expanding, which may present a problem with choosing the right one if you aren’t particularly acquainted with all the intricate details of these often rather complex exercising utensils. For this reason, we’ve done our research and among many interesting models chosen an interesting solution which has both a great price, as well as numerous interesting features to look forward to. 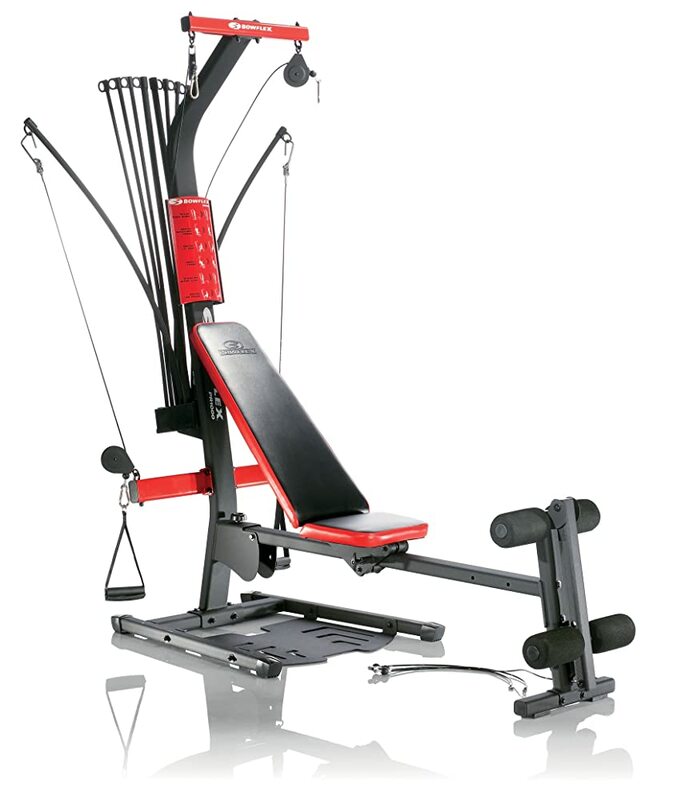 This Bowflex PR1000 Home Gym model features numerous specifically constructed parts to exercise and stimulate different muscle groups, ranging from your legs and torso to your back, arms and everything in between. You can perform up to thirty exercises, each meant for a different body part, which means that you can have a total body workout whenever you like and shape your body according to your desire without going to the gym. This versatile contraption does not just concentrate on strength exercises and muscle building, as it has a variety of additions specifically included to stimulate the cardio workouts, which include a number of health benefits such as increasing your toughness, improving your heart health. One of the examples of cardio-oriented additions is the built-in rowing station which can be folded when you’re finished with your exercises, thus taking up as little space as possible. Also, to complete the rowing exercise experience, the seat is made to slide back and forth as though it was a real rowing vessel. On the upper part of this home gym, there are innovatively designed handgrips along with ankle cuffs which prevent injuries and contribute to the flexibility and improved performance during the workout. For easier reference, there is a workout placard to help you orient yourself around this complex and versatile utensil. As for the dimensions of this home gym, it is 84 inches long, 38 inches wide and the height is 81 inch, which pretty much means that the minimum space required to position it would be 100 x 78 inches for most comfortable use. The maximum user weight amounts to about 300 pounds, and when it comes to the power rod resistance, it is somewhere around 210 pounds. For the exercises concentrating on leg muscles, there are four-inch roller cushions which are upholstered and offer better grip and comfort when performing, for example, leg extension and leg curls. The aforementioned handgrips can also be used for horizontal bench press and the lat pull-downs, among other exercises. The primary benefit of using this home gym, as well as any other item of this type, is that you work under your own terms. This means that you have the freedom to kick things off at your own tempo whenever you want. You’ll be relaxed, there won’t be any queues for any exercise machine, they will all be yours. It is also more hygienic when you’re the only person using the machine. Needless to say, this approach will also save you money from all those gym memberships. To focus on some of the specific advantages the PR1000 home gym brings, we would first have to point out the device’s ability to utilize a variety of bench presses, including horizontal, decline, and include. Also included in the mix are seated lat rows, as well as rear delt ones, low back extension, and much more. Additionally, frequently hailed parts include those smooth roller cushions that allows highly effective leg exercises, as well as a seat rail optimized for aerobic rowing. These are all factors wanted by female users, so if you’re a lady you have a few extra reasons to get this machine. However, the boys are doing just fine as well, since that folding bench compartment is not only highly practical, but also highly effective for achieving the desired results. The device is easy to store, and a variety of users has singled out this Bowflex’s ability to deliver well-rounded body workouts as a prominent key point. On the financial side, let’s make an investment like this once beats gyms. And finally, these machine are very versatile, with over 30 exerciese and will allow you to any muscle group you want. First off, to start with the pros, this home gym includes a myriad of compactly constructed utensils for working out virtually all muscle groups on your body. Specifically, the number of exercises you can do over thirty. It can be used both for muscle building and strength exercises, as well as for cardio training. The weights can be adjusted according to personal preference, and they range from 5 pounds to 210 pounds of resistance. The innovative Power Rods will help you organize your weights and serve you a long time, as they are built out of composite durable material for increased strength. Gets easily folded and reduces space consumption when unused. The price is quite fair considering what you get. The cons would include the inability to upgrade it to 310 lbs, which some advanced users might find a bit disappointing. If you wish to see this great home gym in action, see video below which features some of the exercises described above. Enjoy the exercise! When all factors are combined, this is definitely a worthy contestant for the title of the best home gym on the market today, especially within this price range. The good things about this device clearly outweigh the bad points and we are left with no choice but to give it a thumbs up. Good stuff, highly recommended!